The German invasion of France and the Low Countries began on 10 May 1940. The battle consisted of two main operations. In the first, Case Yellow, German armoured units pushed through the Ardennes, to cut off and surround the Allied units that had advanced into Belgium. During the fighting, the British Expeditionary Force and many French soldiers were evacuated from Dunkirk in Operation Dynamo. In the second operation, Case Red which started on 5 June, German forces outflanked the Maginot Line and pushed deep into France. Italy declared war on France on 10 June and soon afterwards the French government fled to Bordeaux. Paris was occupied on 14 June. On 22 June, an armistice was signed between France and Germany, going into effect on 25 June. A British invasion was expected to follow. German artillery units now had a commanding position along the channel coast which was essential if they were going to launch 'Operation Sea lion', the proposed seaborne assault on South East England. Several batteries of German guns were rail mounted. In the 1930s the English Channel was defended by short-range artillery left over from the first war which would be totally inadequate during the expected invasion. One of Winston Churchill's first task as Prime Minister was to search for extra fire power with three categories of defence required to defend the straits of Dover. Firstly there were long range guns that could bombard targets in France, secondly there was need for intermediate range guns capable of hitting enemy shipping in the channel and lastly there was a requirement for mobile super-heavy rail mounted guns that could be used against shipping and artillery targets and if need be withdrawn to pound the invasion beaches. The idea of railway guns appears to have been first suggested in the 1860s by a Mr Anderson, who published a pamphlet in the United Kingdom titled National Defence in which he proposed the use of ironclad railway carriages. A Russian, Lebedew, claimed to have first invented the idea in 1860 when he is reported to have mounted a mortar on a railway car. Boche-Buster was made famous when Major Cleeve fired 'the kings shot' near Arras in Pas-de-Calais on 8 August 1918 during an inspection by King George V.
A drill session in progress as HMG Boche-Buster waits outside the south portal of Bourne Park tunnel. Two 18" barrels were also made for Boche-Buster and its sister Scene-Shifter in case the 14" ones were inadequate. 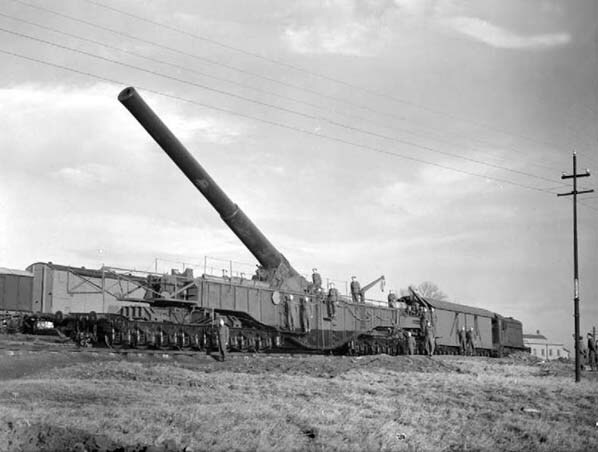 They were designed to have the same exterior contours and dimensions as the 14" guns so that they were immediately interchangeable in the mounting without adaptors. This was possible despite a 4" difference in calibre, because howitzers are less highly stressed than guns so the barrel walls could be thinner. HMG Boche-Buster waits outside the south portal of Bourne Park tunnel. The design was completed in 1918 and two barrels were made but they were not ready until after the war when they were mounted and proved in turn, after which they were put into storage. The Prime Minister, Winston Churchill inspecting HMG Boche-Buster at Bishopsbourne station in June 1941.
sent to the Royal Arsenal at Woolwich. provide training in the specialised drills for handling the assortment of sometimes still experimental, railway-mounted 9.2-inch guns and 12-inch howitzers that had somehow survived the years of indecision between the war. New weapons were in short supply. 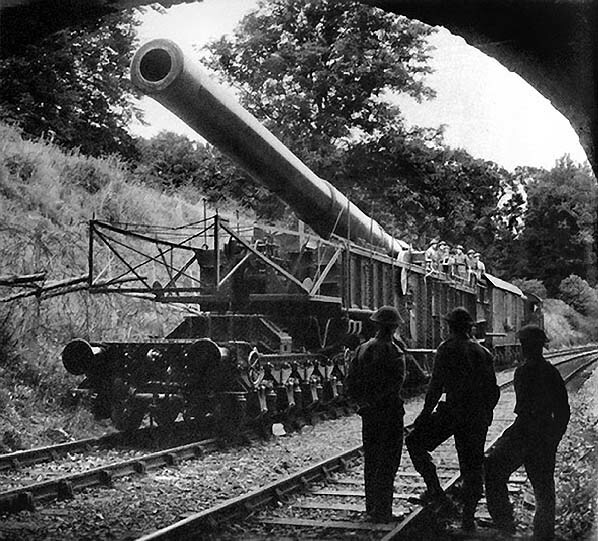 Churchill had hoped to persuade the armaments industry to produce an entirely new railway gun against an almost impossible time-scale but, he had to settle for second best by reactivating some of the existing WW1 artillery. Cleeve found Boche-Buster in a transport shed at Ruddington covered in cobwebs and was present when the doors were opened for the first time since the 1920s. During 1940 the carriage was taken to the railway workshops at Darlington (near Catterick) and after being mated with the 18-inch barrel from the Royal Arsenal it became the largest of the British WWII heavies. Boche-Buster was manned by 50 men and several specialist gunnery officers from the 2nd Regiment Royal Artillery (RA), the complete battery of 80 men was known as the 11th Super Heavy Battery. The Elham Valley Railway was quickly made ready for the arrival of HMG Boche-Buster. Four brick magazines were built in the cutting north of Bishop Park tunnel and steps were cut into the banks either side of the southern portal of the tunnel where the gun would be housed. The military, it could be said, owed quite a debt to the stubborn Matthew Bell and his insistence that an unnecessary tunnel should be built so as not to spill the view from his bedroom window. Huge timber baulks were installed beneath Railway Hill and Barrackers Road bridges to support the girders as the 250 ton gun far exceeded the weight limit of the line. The SR’s platelaying gang were busily engaged in relaying certain sections of track between Bishopsbourne and Barham with 24 sleepers per 45 ft length instead of the regulation 18 and reballasting this with fine granite chippings. 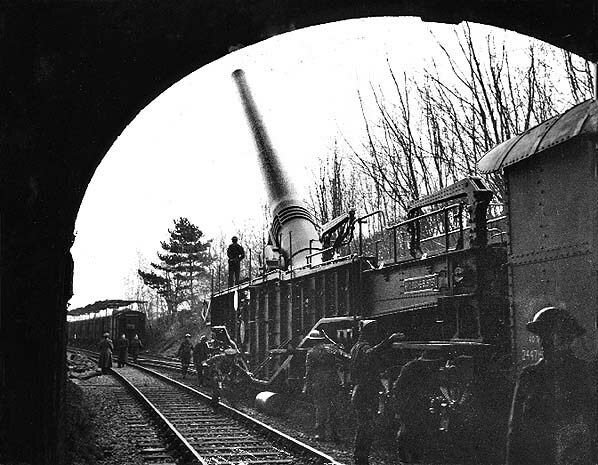 The Elham Valley branch was ideally suited to the needs of the War Department and to the big gun which could only fire parallel with the track. The meandering line allowed it to sweep virtually the complete south-eastern corner of Kent, thus effectively enabling it to bombard any invasion force. A 200-yard camouflaged firing spur was installed into a new cutting in the fields west of the line at Kingston on the Charlton Park Estate where, by reversing, the gun could be aimed at Pegwell Bay near Ramsgate supporting the 43rd Infantry Division. Calibration shots were fired locally from there between February - April 1941. Capable of hurling a 6 ft shell weighing 1½ tons some 12½ miles, it would have been sufficient to blast the coastline had the need arisen. Boche-Buster was a high-angle Howitzer with an elevation of 40° but with a traverse of only 2°. After initial training at Catterick Camp the battery moved south arriving at Bishopsbourne in February 1941 after a 43 hour journey from Catterick disguised as a string of banana wagons. On the bright spring morning of 13th February 1941, the gun was pushed out of the tunnel by a WD diesel engine, through Bishopsbourne station to the Kingston spur, where it was fired for the first time sending several rounds into the English Channel. Although the villagers had been warned to open all their windows, considerable damage was caused in Kingston and Barham by the shock waves which brought down a number of ceilings. As a result, only two other test firings were made near World’s Wonder bridge and at Lickpot bridge. It was on one of these trips that an officer in charge, on cautioning his men to be mindful of the low bridges, was promptly knocked unconscious himself as the gun passed underneath South Barham bridge! Apart from the blast damage the track had to be strengthened every time it was fired. Winston Churchill inspected the gun at Bishopsbourne on 20 June 1942 and later that day toured the gun emplacements at Elham and Adisham. The battery had its headquarters at Charlton Park with offices at Bishopsbourne station. Although it never fired in anger, the gun was frequently photographed in aggressive poses and was billed as a 'fearsome cross-channel monster' but the truth of the matter was that being a howitzer it had barely enough range to command the Kent coast and had no hope of putting a shell even half way across the channel. Although the gun never sustained a direct hit, on one occasion a near miss caused some damage to its axle boxes whereupon the SR’s Ashford Works Manager was summoned for an inspection. He arranged for the repairs to be carried out at the Ashford Wagon Works. On another occasion a bomb landed on the track at Kingston but failed to detonate. On 30th October Mrs. Churchill and Mrs. Roosevelt, the wife of the American President, visited Barham Women’s Institute in an impressive double-headed train of seven LMS coaches. In the following December a marauding aircraft sweeping low along the valley shot up the gun emplacements at Elham and ignited the tarpaulins covering the shells stored on the platforms. 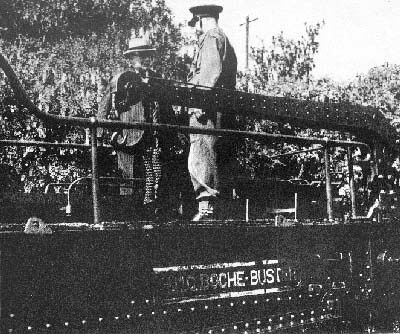 Boche-Buster was not the only rail gun to use the Elham Valley Railway. On 26 March 1943 the 13th Super Heavy Battery used the railway spur at Lyminge to test fire two 12-inch guns, No 1 gun to the west and No. 2 gun to the east. On 1 January 1940 two 9.2" guns of ‘Y’ Battery of the Canadian Royal Artillery and 7th Battery 2nd Super Heavy Regiment were sited at Elham. These were replaced by two 12" guns of the 8th Battery, 2nd Super Heavy Regiment in 1942. In 1943 Boche-Buster found its way back to Salisbury Plain to fire trials of a new anti-concrete shell. 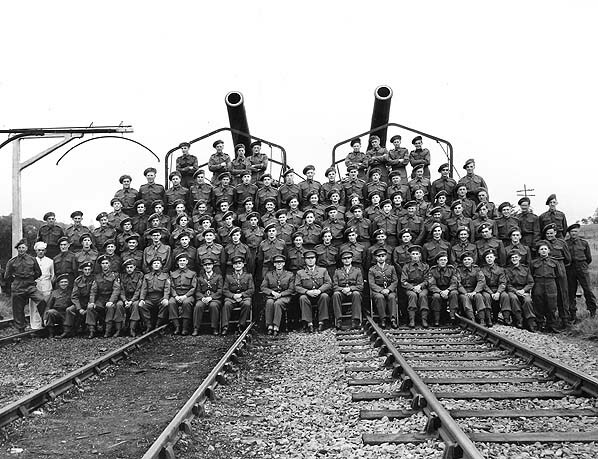 By the end of 1943 all the railways guns had been withdrawn from the Elham Valley and the units were disbanded. Although the anti-invasion guns were to spend long months waiting on the sidelines, if the Germans had crossed the Channel during the winter of 1940-41, their fire-power would have been a most significant factor in the battle that would have followed. After the warm Boche-Buster was taken to the Royal Arsenal and it was cut up in the early 1960s. 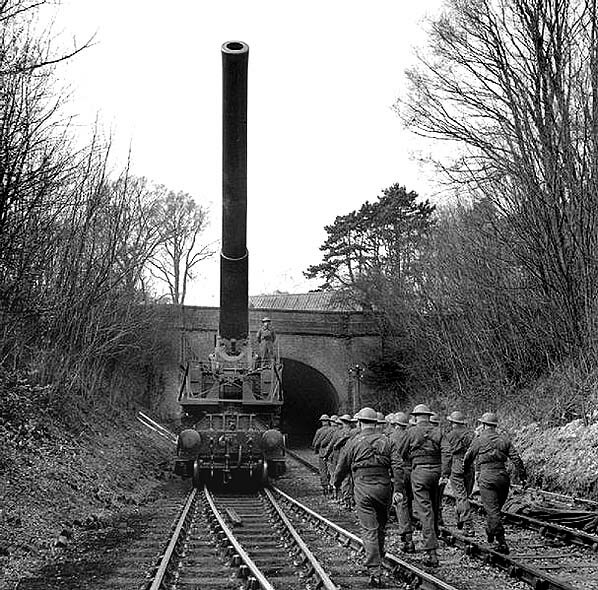 No railway guns exist today although one of the 18" barrels is still kept at Shoeburyness.